We thought it appropriate to point out the HuskyRomi Wolf Sanctuary in the Free State (in Reitz, near Bethlehem) once more, especially after they have put in so much effort to revamp it. The Easter holidays are around the corner, and it will definitely be a good idea to pop in at this marvellous place even if it means taking a little detour. They even have camping facilities now, at very reasonable tariffs. In this month’s issue, we supply the second and final part of our overview of the world’s wolf populations still existing per country, this time for Asia and North America. It is telling that no reliable up-to-date information could be found for the US. Closer to home, please take a look at the appeal for help from IFAW in the Other News section. Climate change has effects most people wouldn’t probably normally think of – until we notice it appearing in our homes. We need your help to finish up some projects at the new Wolf Care Center before we can welcome our new pups in May! Spend the weekend doing physically demanding, but mentally rewarding work. 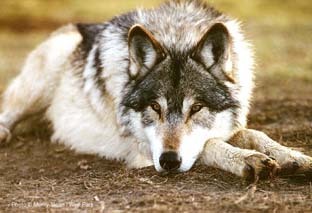 The wolves will certainly be interested in our activities and be stimulated by all the new smells in the enclosure. This is a great opportunity to help improve the lives of our ambassador wolves and get an inside look at captive wolf management. 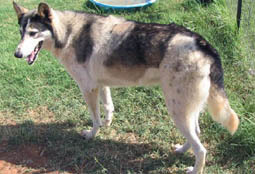 The HuskyRomi Wold Sanctuary is a non-profit organization providing a safe haven for abandoned and abused huskies and wolves in South Africa. 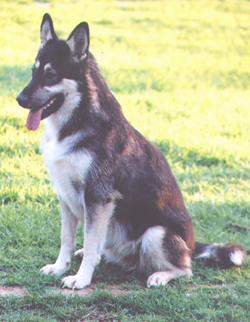 It provides a home to all huskies and wolves that can’t be kept as pets because of their complicated nature. Many of the animals arriving there are in a poor condition, some not even knowing what grass is, and are rehabilitated with loving care by Larry Paul. Their website was started to provide support to the HuskyRomi project and promote the protection of wolves and other wildlife. The sanctuary is open to the public to come and learn about wolves. Larry and his team do appreciate donations for the buying of food, veterinary bills and other expenses. All the huskies are spayed and neutered when they arrive at HuskyRomi. There are currently twenty-five Huskies and one hundred and sixty seven Timber wolves and hybrids. 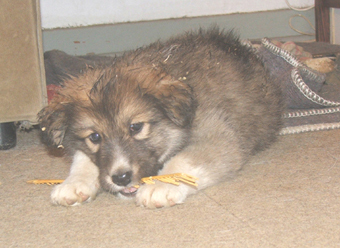 HuskyRomi is NOT a breeding facility and they DO NOT sell wolves, dogs and hybrids. Their purpose is to take care of such animals for the span of their natural lives since they cannot be kept as pets under normal circumstances. 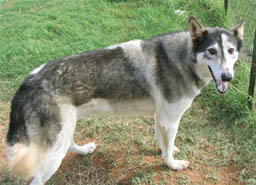 The sanctuary was started on 16 December 2007 with the intention to start a haven for huskies. 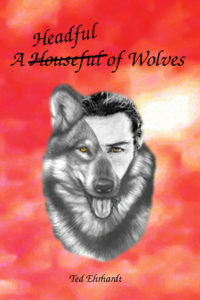 Larry had 18 huskies and three wolves, but he never foresaw what was going to happen next! 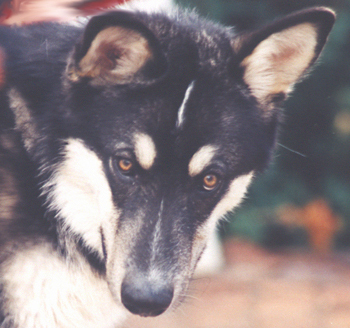 Kia was the first wolf, a beautiful guy, who was kind and gentle. He came from a situation in Dainfern where he was beaten with a hosepipe and kept locked up in a small courtyard. 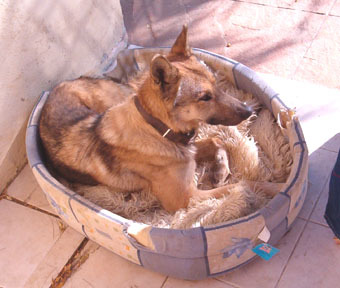 Soon after Kia arrived, Larry received a call about a wolf who had just had puppies with a German Shepherd and now they wanted to get rid of her. Mia came into his lives. She was so scared, she would just sit in the corner the whole day long. It was then that he realized that she had been chained up and didn’t know what it was to run free. He would drag her to the furthest point in the garden and let her go, but she would run straight back to her corner. It took many weeks, but he finally got her to walk around on her own. A call from Save-a-Pet in Port Elizabeth saw him bringing 12 wolves back, and with the next call out he ended up bringing 37. 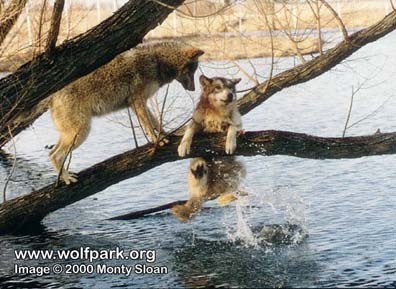 This was the beginning of the wolf rescue. 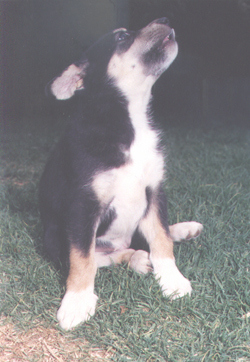 Since then Larry has collected wolves from Cape Town, Durban, Bloemfontein, Ventersdorp, Britz and all over Gauteng. 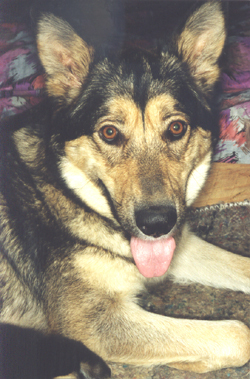 Nowadays he gets calls from all over the country about wolf rescue, advice on how to keep a wolf as a pet and so on. The most recent rescues of 2015 was Siox from a taxidermist in Pretoria. 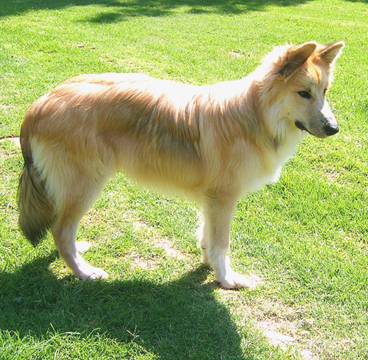 Princess, from Badplaas, who was on the verge of being killed by her two sisters. Two weeks later he also collected a brother and sister from a yard in Boksburg. The rescue work never stops! program, kindly contact Larry at larry@huskyromi.co.za or call him on +27 71 679 5141. Due to some confusion, Larry decided to simplify the sponsorship or “virtual adoption” of wolves at HuskyRomi. Decide whether you wish to do a once off donation or if you want to continue with a monthly sponsorship. 2. If you wish to make a once-off donation, kindly submit it into the NPO account and notify Frans or Larry about it if possible. 3. Decide what amount you are prepared to donate on a regular monthly or yearly basis. 4. Decide towards which individual wolf or pack you wish to contribute. 5. Decide on which date you will start your contributions. 6. Please notify Frans or Larry about your decision. 7. Please notify Larry if you cannot continue with the sponsorship as this will impact on our budget. The Sanctuary requires around R1000 per pack or enclosure, or R500 for a specific individual wolf per month. Any amount however will add up towards this goal and assist us to balance the budget. All regular sponsors are eligible for certain privileges such as discounted (or free) entrance to the sanctuary and camping. If you sponsor on behalf of your business or company, you are also eligible for advertising space at the enclosures and on the sanctuary literature and links on our website. For any questions about or should you wish to sponsor a wolf or husky at the HuskyRomi Wolf Sanctuary, please contact Frans Badenhorst, Email : fransbad@gmail.com, Whatsapp or SMS : +27 71 561 6162 or Larry Paul, Email : larry@huskyromi.co.za, Whatsapp or SMS : +27 71 679 5141. Just leave a message and you will be contacted as soon as possible. 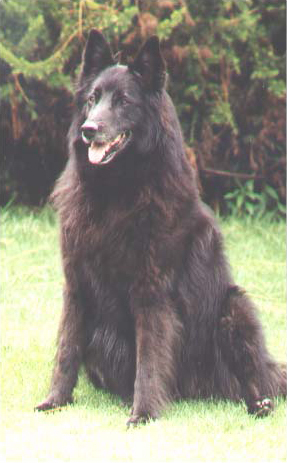 Should you wish to name a wolf, for instance in remembrance of a loved one or pet, you may arrange it with Larry. They just request that you then will be prepared to do a full monthly sponsorship of that wolf for a period of at least two years. All sponsorship and donation money must please be paid into the HuskyRomi NPO cheque account. Please put your name or the name of the sponsored wolf or husky as the reference. Disturbing information, made available today through email correspondence with the Center for Biological Diversity and phone calls to Idaho Fish and Game, reveals that USDA Wildlife Services is using radio-collars on wolves in an outrageous, long-term “Judas wolf’ culling strategy like that used in British Columbia (Canada). The details of this troubling practice are worse than anyone suspected, and will outrage wolf and wildlife advocates everywhere. The Wildlife Conservation Examiner had just come across alarming news on the Never Cry Wolf (Wildlife Defence League) website. In their February 18, 2016 press release, they revealed that BC Liberals in the South Selkirk region have been radio-collaring wolves, purportedly to save dwindling mountain caribou herds. But the purpose isn’t ‘research’, as some believe, or even, as wildlife advocates have suspected, to track collared individuals back to their den sites, after which Bighorn helicopters come in and slaughter the entire family – pups and all. No, it’s much worse than that. In their post South Selkirk Wolves Confirmed Slaughtered in Second Year of BC Wolf Cull, Never Cry Wolf revealed with horror that the tragic collared wolf, the so-called ‘Judas’ wolf, is doomed to a life of repeated persecution, adversity and mourning. “We were shocked to learn the Judas wolf is kept alive year after year,” said Tommy Knowles, Campaign Director for Wildlife Defence League. “He or she is left to pack up with a new family, who are deliberately baited into the territory. The next winter, the Judas wolf’s new pack is slaughtered. If watching your family killed year after year by snipers in helicopters is what this government considers a “humane” cull, I shudder to imagine what they consider inhumane.” Appalled, The Wildlife Conservation Examiner wondered if it’s just British Columbia using a poor, lonely, unwitting ‘Judas’ wolf to repeatedly betray his or her own family – Or if we’re doing it here, too. When asked if the use of ‘Judas’ wolves goes on in America, the Center for Biological Diversity confirmed the unsettling truth and furnished this statement specifically for this article: After Congress bypassed the Endangered Species Act through a rider that stripped wolves in Idaho from protection, the U.S. Department of Agriculture’s Wildlife Services agency began radio-collaring so-called Judas wolves, shooting their families from the air, and sparing the collared wolf so that they can do it again,” said Michael Robinson of the Center for Biological Diversity. “Congress now threatens to inflict the same cruelty on wolves in Wyoming through stripping them of their protections as well as protections for wolves in the Great Lakes region.” With this chilling information, a call was made to USDA APHIS Wildlife Services, where a chipper and extremely helpful lady named Sue offered to transfer the call to a man in Idaho who, she happily assured, could answer any questions about their wolf-collaring program. A couple minutes later, a gruff-sounding man named Todd picked up. This reporter innocently asked who would be the person to could talk to, to learn about the program and the collaring of Idaho wolves? Turns out ‘Todd’ was none other than Todd Grimm, himself, Idaho State Director of the infamous rogue agency Wildlife Services – And he sounded edgy, hesitant and nervous. “Uhm, we – uh, we don’t really do that, no,” he said, after a long pause. Then, suddenly more sure of the direction he was going to take, his voice grew more authoritative, edged with anger, “That’s a State issue.” He provided some names and numbers at Idaho Fish and Game. So there it is. Our United States Department of Agriculture certainly is collaring and slaughtering wolves using an unwitting ‘Judas’ wolf to torment repeatedly. But the Director of USDA Wildlife Services, Todd Grimm, maintained they didn’t collar wolves, at all. Why lie? Another curious discrepancy; Ms. Struthers confirmed that no research is done by Wildlife Services, yet their (public) website (USDA APHIS Wildlife Damage Management) says they do. Again, why lie? To present a friendlier face to the public? Who are we to believe? More to the point, is this how we want our tax dollars being spent, to slowly torment a being as social, emotional and family-oriented as a wolf, systematically destroying everything that matters to her, over and over again? Will we allow our government to continue carrying out these atrociously unethical familicides on one of our most beloved and iconic species, our beautiful, intelligent, melodious and vulnerable gray wolf? Congress is at it again! An appalling bill making its way through the U.S. House of Representatives is a serious attack on wolves and other vulnerable wildlife. A group of anti-wolf representatives have proposed an amendment that would delist wolves in Wyoming and the Western Great Lakes and prevent citizens from going to court to challenge those decisions. Other lethal provisions would leave Africa’s remaining elephants at the mercy of poachers and prevent common-sense restrictions on the thousands of tons of toxic lead that pour into wildlife habitats across the country every year. The “wolf political persecution” amendment – would delist wolves in Wyoming and the Western Great Lakes and hand wolf management authority back over to four states. In Wyoming, this means shoot-on-sight killing of wolves in over 80% of the state. This amendment also deprives citizens of their right to go to court and challenge these delisting decisions under the Endangered Species Act. The “kiss elephants goodbye” provision – would block recent efforts by the Obama administration to crack down on ivory trafficking and the domestic sale of illegal ivory from brutally killed elephants. It would completely undermine the recent commitment between the U.S. and China to halt the illegal ivory trade and sale within both countries, making the U.S. complicit in the poaching crisis that kills an elephant every 15 minutes. The “lead, bring it on” provision – would forbid federal agencies from regulating most forms of lead ammunition and fishing tackle. In the United States, an estimated 3,000 tons of lead are shot into the environment by hunting every year, another 80,000 tons are released at shooting ranges and 4,000 tons are lost in ponds and streams as fishing lures and sinkers, leading to the death of millions of birds and other animals from lead poisoning. This Congress could go down in history as the most anti-wildlife Congress ever. And this bill in its current form is a tragic example why. If the states of New Mexico, Arizona, Utah and Colorado get their way and the U.S. Fish and Wildlife Service (FWS) doesn’t stand up to them, the Mexican gray wolf, or lobo, will go extinct in the wild sometime very soon. Extremists in these states have all but paralyzed efforts by FWS to foster recovery of the lobo, the world’s most endangered gray wolf subspecies. The just-released 2015 annual wolf count bore bad news. 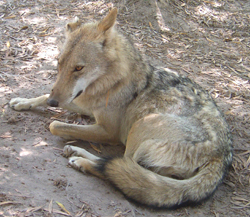 In the U.S., the wild Mexican gray wolf population has dropped by 12 percent in the past year to just 97 animals. Even more alarming, FWS had predicted that this fragile population would grow 10 percent annually, not shrink! The bottom line is this: Unless more lobos are released into the wild, and unless additional populations are established, they are doomed to go extinct in the wild. The Four Corners states have put enormous pressure on the FWS to limit its conservation efforts for lobos. And just recently, the state of Colorado’s Parks and Wildlife Commission passed a resolution opposing any wolf reintroductions in that state. Help prevent a preventable extinction. 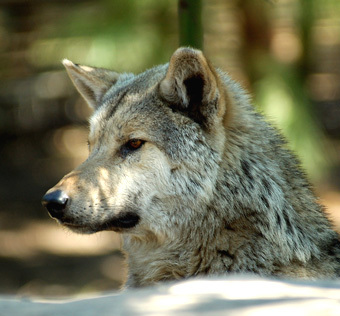 Mexican gray wolves are the most endangered gray wolves in the world. Unless more Mexican gray wolves are released into the wild, and additional populations are established, they are doomed to go extinct. 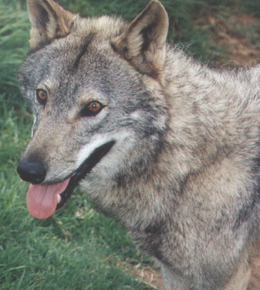 State game commissions and anti-wolf extremists in New Mexico and Arizona have thrown obstacle after obstacle in the way of lobo recovery. And after 40 years on the endangered species list, the U.S. Fish and Wildlife Service has yet to complete a valid recovery plan for lobos. In fact, the just-released 2015 annual wolf count bore more bad news. The wild Mexican gray wolf population in Arizona and New Mexico has dropped 12 percent in the past year, to just 97 animals. Even more alarming, FWS had predicted that this fragile population would grow 10 percent annually, not shrink! We’ve gone to court. We’ve worked with ranchers to help them learn to reduce conflicts with wolves. And poll after poll shows that the citizens of Arizona and New Mexico favour the return of the lobo to their historical habitat. Mobilize our members by the tens of thousands to speak out for vulnerable lobos. With your continuing support, we will never give up the quest to see Mexican gray wolf populations healthy and growing again. 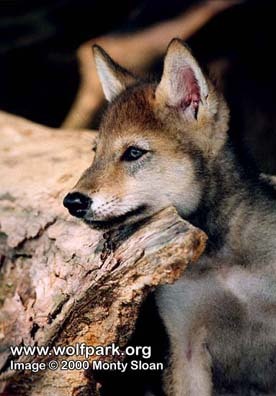 Mexican gray wolves are some of the rarest and most endangered mammals on the continent. With only an estimated 110 remaining in the wild, the U.S. Fish and Wildlife Service is finally beginning to work on a recovery plan to keep them from extinction. However, the governors of Arizona, New Mexico, Utah and Colorado are bowing to pressure from ranchers and anti-wolf interests to block the progress of these plans. Their attempts to undermine the recovery of these wolves are based on false information contrary to scientific studies on this issue. Urge the U.S. Fish and Wildlife Service not to allow anti-wolf politicians to interfere with the recovery of the Mexican gray wolf. If we don’t move forward quickly, these wolves are at risk of being wiped out completely. The Idaho Department of Fish and Game has illegally collared four wolves, which could easily be used to follow them back to their packs. While the U.S. Forest Service authorized radio collars for elk, using them on wolves is in direct violation of the agency’s conditions. Demand that the collars be taken off immediately before entire wolf packs are put in mortal danger. Sandy, the sweet dog, was so tired that her legs just gave out on the examination table. Make an emergency gift today. Syria has an unprotected, unknown number of wolves, thought to be roughly numbering 200. No livestock damage compensation is paid. 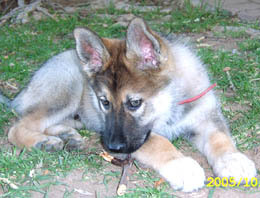 Lebanon has a population of 50 wolves that are afforded no legal protection, nor is livestock damage compensation paid. Israel has a stable population of 150 protected wolves. Some livestock damage compensation is paid. Jordan has an unprotected, unknown number of wolves, thought to be roughly numbering 200. No livestock damage compensation is paid. Saudi Arabia has a stable population of 300-600 wolves that have no legal protection. No livestock damage compensation is paid. India has a decreasing population of roughly 1,000 wolves that are legally protected. No livestock damage compensation is paid. Wolves in China appear to be decreasing in number throughout the country. Currently, Heilongjiang has roughly 500 wolves, Xinjiang has 10,000 and Tibet has 2,000. In 2006, the Chinese government began plans to auction licenses to foreigners to hunt wild animals, including wolves. No livestock damage compensation is paid. Mongolia has a stable population of 10,000-20,000 wolves that have no legal protection, nor is livestock damage compensation paid. Kazakhstan has a stable population of about 30,000 wolves. About 2,000 are killed yearly for a $40 bounty, yet their numbers have risen sharply. No livestock damage compensation is paid. Turkmenistan has a stable population of 1,000 wolves that are unprotected. No livestock damage compensation is paid. Uzbekistan has a stable population of 2,000 wolves that are unprotected. No livestock damage compensation is paid. Kyrgyzstan has a stable population of 4,000 wolves that are unprotected. No livestock damage compensation is paid. Tajikistan has a stable population of 3,000 wolves that are unprotected. No livestock damage compensation is paid. 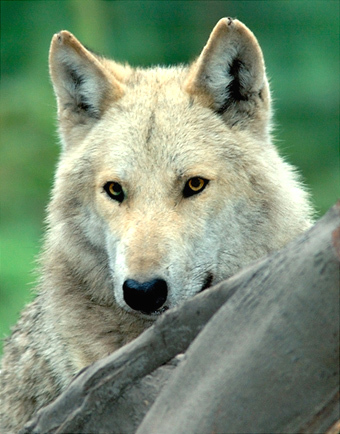 There are currently no recent or reliable estimates on wolf populations in Iraq, Iran, Afghanistan, Nepal and Bhutan. Canada has more than 60,000 wolves, which are legally considered a big game species. They are afforded protection in 3% of Canada’s territory. The Northwest Territories, Nunavut and Yukon have 5,000 wolves each, British Columbia has 8,500 wolves, Alberta 4,200, Saskatchewan 4,300, Manitoba 4,000-6,000, Ontario 9,000, Quebec 5,000 and Labrador 2,000. Canada currently has no livestock damage compensation programmes. 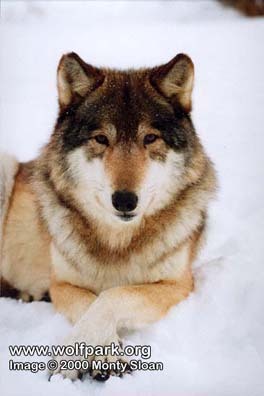 In fall of 2012, the government of British Columbia was considering a cull of the wolf population in some areas. In winter of 2015, the government of British Columbia began undertaking a cull of up to 184 wolves in an effort to curb dwindling caribou populations in the South Selkirk Mountains and the South Peace region. The cull, like ones before it, is opposed by some environmental groups. 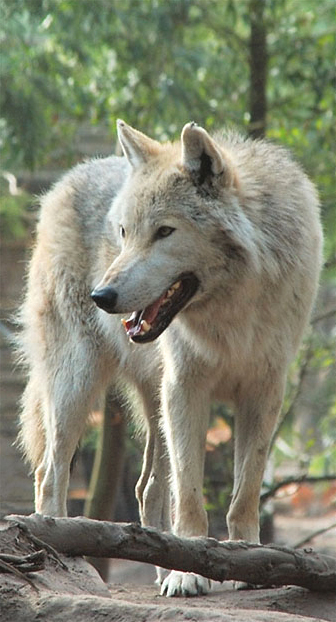 On 12 March 2012, a Grey wolf, mistakenly thought to be a coyote, was shot in Newfoundland. It was the first confirmed grey wolf on Newfoundland since ca. 1930. The United States as a whole was thought to have up to 9,000 wolves in 2013 or 14. Due to recent killing sprees, this number is likely to have decreased even though populations might have been thriving in places. No really reliable information on the numbers of wolves per state appears to exist at the moment other than for the lobo (red wolf): a sorry 97. The wolf was extirpated from Mexico since the 1970s when the U.S. and Mexican governments cooperated to capture all remaining wild Mexican wolves and initiate a captive-breeding program in an attempt to save the local subspecies. One day I smelled a kill, I was just going to walk away but the smell was over-powering. I just could not walk away, so I decided to trot down there and check it out. When I got down to the dead animal, I saw that it was just killed, not even five minutes old. I started to eat it when I heard something in the bush. It was a tall, white skinned-animal walking out of the bush carrying a long, black thing, he yelled,” go on now and git”. Then a loud noise came out of the black thing and the ground flew up and covered me. It frightened me, I did not run. He fired again and this time a sharp pain came from my chest. I fell. I started having trouble breathing. I howled and yelped and whimpered. I remember that day. The day the white animal came and I brushed death and looked it in the eye. That was the day I learned to listen to my instincts, and stay away from the white-skinned animal. Boy, it’s still very hot up here, and although we had some good rain in between, the garden has suffered badly, the fruit harvest was near zero, and now the rains are getting less and less. As if that would not be bad enough already we have a flea invasion like I haven’t seen before. The whole house is covered in Carbadust powder and we have to use it or coconut oil on the pack every few days to keep these terrible blood-sucking bastards away as good as possible. The major problem with the coconut oil is that they love the taste of it, and the moment we have applied it to their coats they will start licking it off each other. Well, at least it’s not dangerous and rather healthy for their coats and skin. Otherwise everything is fine here, besides of the trouble we have with our postman. We have a small mailbox attached to the gate right in front of the house, and whenever this guy arrives here with his bicycle and the safety helmet on his head, the whole pack will go mad and attack the gate. They get so excited that they even start howling because they cannot get to him, or maybe they want to warn others in the area that he is coming. Whatever it is, they never behave like this with anybody else. Now, this guy is too scared to push the mail into the box because he thinks he will get bitten, but actually the bars of this gate are so close together that they cannot get their heads through it, not even the muzzle, so there is no way they could bite him. But he insists, and now he doesn’t use this mailbox anymore but squeezes the letters between the gate and its frame, which results in a part of letters sticking through the gate right at the perfect height for the kids to grab them, pull them through and do with them what they actually would like to do with the postman. O.k., what is delivered by him is actually nothing important, just some flyers or the TV journal for our tenant, but hey, he is not happy about the fact that his journal arrives at his place either as a puzzle or soaked in rain (if we get any). Ted and I are keeping an eye on the gate when we hear the pack going wild, just in case it’s the postman, to be able to fetch the mail before the kids do. I wonder what it is about that man that makes them so angry; is it the bicycle or the helmet? I have no clue. In Germany, they always said it was the uniform their postmen wear, but our postman doesn’t wear a uniform. Well, whatever it is, they do hate him with a passion, and we might have to move the mailbox to the big gate to make sure that he will not throw our mail into the next ditch to protect himself from our “dangerous” animals.